The item was made safe by the army bomb disposal squad. A GRENADE DATING back to the early 20th century was found in Macroom today. The find came just a little while after a shell was found on a Co Kerry beach. The Defence Forces said this evening that an army bomb disposal team rendered a Mills-type grenade dating from the early 20th Century in Lissarda near Macroom, Co Cork this evening. They said that the team were returning to base from an earlier call out to Co Kerry, where they had determined that a suspicious object found on Rosbehy Beach was “an inert shell without explosive content”. While on the return journey, they got another request from local gardaí. The team arrived at the location at 6.10pm and examined the grenade. It had been found in foliage on farmland and was decided to be “potentially very dangerous”. The grenade was then destroyed at the scene at 6.40pm through a controlled explosion. Because the grenade was found in a remote rural location, there was no requirement for a cordon or evacuations. This was the fourth request for bomb disposal team assistance today. Their other requests included a viable improvised explosive device in Co Monaghan and unstable chemicals in a school in Co Carlow. 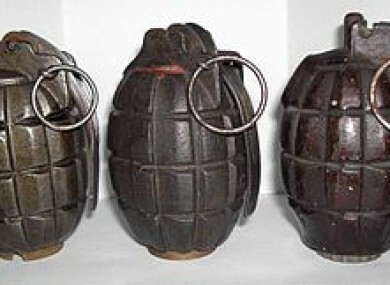 Email “"Very dangerous" early-20th century grenade found in Co Cork”. Feedback on “"Very dangerous" early-20th century grenade found in Co Cork”.